Lock in a great price for Holiday Inn Munich City Centre – rated 8.2 by recent guests! It’s a chain hotel so it was just as expected nothing special and nothing less. Decent place and location. The foyer, it is always full of warm atmosphere around Christmas. The same friendly staff that remember us year after year. Breakfast, although its expensive. The position. Convenience of getting from the airport to the Hotel by train. The shopping centre under the hotel is so useful, a chemist a DM, a supermarket. Sorry to see the discount ski shop is no longer there. The hotel is located very convenient in terms of proximity to the city centre and transport system connection. You can reach it by train directly from the airport even without going outside. It's new and well organized. Personnel was friendly and helpful. +Great location, the hotel connects to the train station through an underground shopping center so it is really easy and convenient to get to the city center, particularly if you are visiting during the winter. +The breakfast is excellent, the offer a wide variety of food, totally worth to get it. +Staff is very friendly. Location, metro was close, easy to get to and from places, great restaurants close. Everything was extra excellent except the parking which has ultra high charges for residents. Holiday Inn Munich City Centre This rating is a reflection of how the property compares to the industry standard when it comes to price, facilities and services available. It's based on a self-evaluation by the property. Use this rating to help choose your stay! 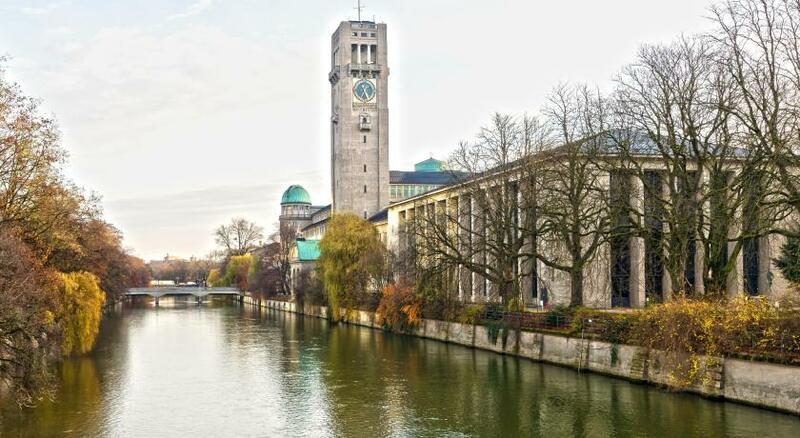 One of our top picks in Munich.Just 1,650 feet from the Deutsches Museum, this nonsmoking hotel in Munich offers soundproofed rooms. Rosenheimer Platz City Rail Station is 150 feet away, just 2 stops from Marienplatz. Set within a shopping complex, the rooms at Holiday Inn Munich City Center feature air conditioning, soundproofing, a flat-screen TV and coffee/tea facilities. The newly renovated executive rooms offer views over the city. Public parking is available at the Holiday Inn. Trains run from Rosenheimer Platz City Rail Station to Munich Central Station in 10 minutes and Munich Airport in 33 minutes. Au-Haidhausen is a great choice for travelers interested in museums, shopping and food. When would you like to stay at Holiday Inn Munich City Centre? 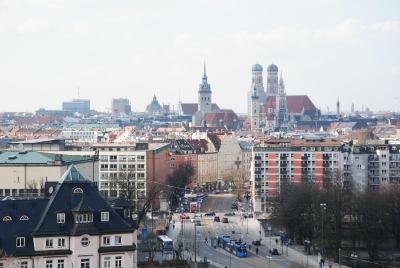 The executive queen room features 180 degree view over the beautiful city of Munich. The room has a warm interior and stylish design and offers a cozy atmosphere with a high quality mattress. Guests can enjoy the diverse mini-bar, modern walk-in shower, a flat-screen TV and free internet access. Guests also receive 2 complimentary bottles of mineral water and 1 chocolate bar from the mini-bar. The executive double room offers a fresh design, cold drinks in the mini-bar and a comfortable double bed. There is a walk-in shower, bathrobes and slippers. This nonsmoking double room features a double bed, soundproofing, air conditioning and electric kettle. This nonsmoking twin room has 2 single beds, a flat-screen TV, air conditioning and soundproofing. This nonsmoking twin room features 2 single beds, a flat-screen TV, electric kettle and air conditioning. Hotel surroundings – This neighborhood is a great choice for travelers interested in museums, shopping and food – Check location Great location - show map Guests loved walking around the neighborhood! House Rules Holiday Inn Munich City Centre takes special requests – add in the next step! Holiday Inn Munich City Centre accepts these cards and reserves the right to temporarily hold an amount prior to arrival. Covered parking spaces are available at the Holiday Inn (see Policies). Please note that check-in for the underage is not possible. Please also note that the pool is currently closed due to renovations until further notice. Needed more milk cartons for my tea! Great room with a nice view. Nice & clean. Nice touch of complimentary water & chocs in the mini bar. Good breakfast with lots of choice. Easy parking on the street outside & close to the centre of town. Friendly staff who were helpful. Location is main advantage of Holiday inn.. very near to city centre...from the one side of hotel you can go to underground bazzar and enjoy trams.. Knocking on the door at 9AM on the day of check out. I expected nicer bathroom comparing to similar properties I have been to. Heating was not so great (or we didn't know how to use it). View was amazing. Bed nice and comfortable. Room was good size and very nice. Awesome place. Location is perfect, bar with a lot of people until late night. Missing only warm food after 23:00. The pressure of the toilet was quite poor and always blocking. The breakfast was very good and also the train and the shopping complex underneath the hotel were super convient. Also room service was very fast and the food was divine.